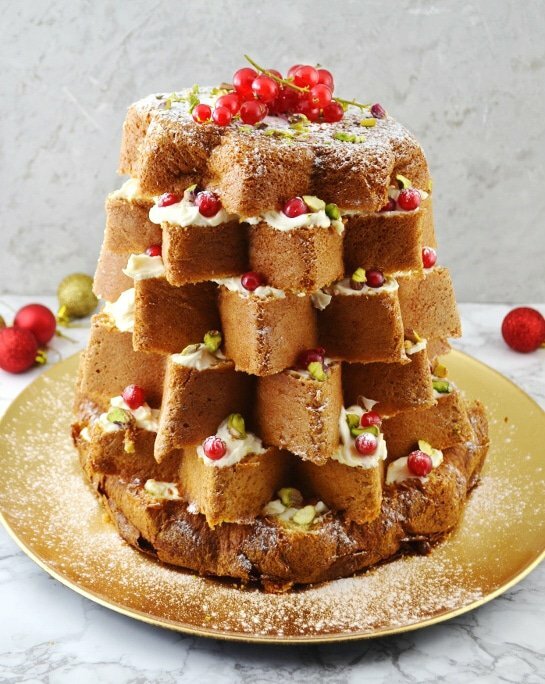 This beautiful Pandoro Christmas Cake with Pistachios and White Chocolate is the perfect show stopper that will only take you 10 minutes. I adore Pandoro ( Golden Bread ) in fact I much prefer it to Panettone at Christmas time. It’s soft, light, delicious and has the most amazing vanilla, sweet smell. Pandoros come in beautifully patterned boxes and are wrapped in a plastic bag with a sachet of icing sugar (powder sugar). When it’s time to serve the Pandoro you tip the icing sugar into the plastic bag and give the bag a good shake, covering the big star shaped cake in beautiful sweet snow. There’s nothing better on a cold Winter’s night when the candles are on and you’re all cozy wrapped up inside with a big slice of pandoro and a cup of steaming hot tea or better yet a little glass of Prosecco. This year I decided to make this classic Italian Christmas cake a little different, something that would give the wow factor on Christmas Day or at parties without any fuss or much effort involved. This Pandoro Christmas Cake is absolutely perfect because it literally take 10 minutes to make or less. Firstly I whip together mascarone, icing sugar and Vin Santo which is a sweet Italian dessert wine until it’s nice and light. I then add in chopped white chocolate and pistachios….it’s SO good. I didn’t add the red currants in to the mixture at this point because they would change the colour of the mixture so instead I simply sprinkled a few over each layer making sure they peek out at the edges to give pops of bright red colour as if Chrsitmas baubles on the tree. The pandoro is already a festive star shaped cake so all I do is cut it into five slices starting from the bottom and working my way up to the top. Each layer is spread with a unctuous mascarpone cream mixture and sprinkled with red currants (you can also use pomegranate for this). Each layer is placed on top of each other so the points are not matching to give the Christmas tree effect. I then add extra pistachios and any left over red currents for extra colour and sprinkle over a little icing sugar. 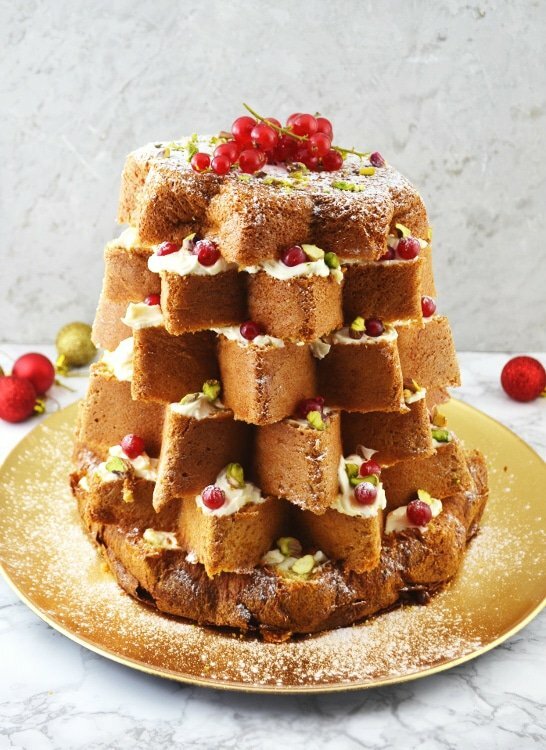 The Pandoro Christmas Cake looks so magical and tastes incredible it’s hard to stop at one slice! If you try this recipe be sure to let me know how you got on in the comments below. You can also FOLLOW ME on FACEBOOK, TWITTER, INSTAGRAM and PINTEREST to see more delicious food and what I’m getting up to. Put the mascarpone in a large mixing bowl with the vin santo and icing sugar and whisk together for 1 minute. Add the chopped white chocolate and pistachios and stir through, set aside. Cut the pandoro in five slices from bottom to top. Spread each layer evenly with the mascarpone mixture making sure to scatter a few red currents on each layer. 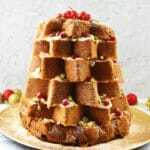 Lay each slice of pandoro on top of each other so the points don't match to resemble a Christmas tree as you are layering the mascarpone mixture. 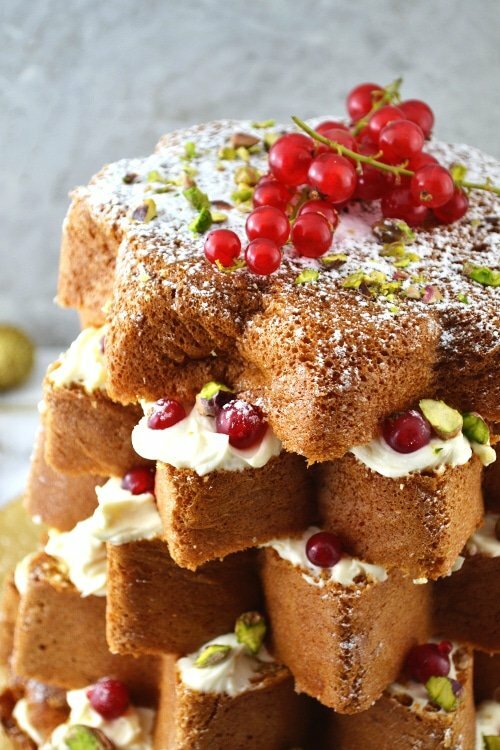 Top with a dusting of icing sugar and some more red currents and pistachios. Wow this looks so delicious! What a delightful addition the the festive table! Hope mine looks as good as yours! I’m sure it will, thanks so much! You certainly achieved the WOW factor with this cake. The icing between the layers sounds perfectly light to match the fluffy cake, and the presentation is absolutely gorgeous! Makes me ready for Christmas! Aw thank you so much Mackenzie, I’m definitely feeling very festive now! I tasted it!!! It has been difficult to stop after the first slice… I could have eaten the whole thing… DELICIOUS!! This is fabulous, I’ve had something similar when an Italian friend served us a pandoro like this with ricotta and dark chocolate. This looks so tasty and a great tip about adding the redcurrants at a later date, I wouldn’t have thought of that and the white is striking. Ooh that sounds delicious, thank you so much! That look so pretty and I love how simple it is to make. Thanks for the recipe. No problem, thank you Veena! Fantastic looking sweet; would impress even the most fussy of our festive visitors. The pistachio’s are a lovely touch. Thanks so much Helen, it’s so easy too!